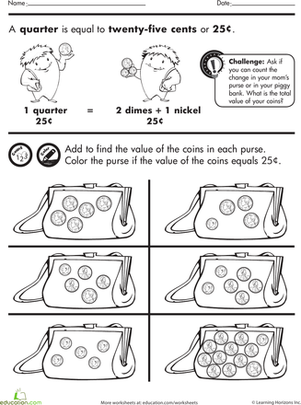 Here's a great worksheet for practicing the money math that your 1st grader will be taught at school. Using the coins you cut out from this page, fill all the blank circles and buy the ice cream, without leaving any unused coins. You can never have too much practice managing money! Luckily, your 1st grader can deal with small amounts, like adding coins to buy candy.